For this project, we had two weeks to choose a brand and design a new experience for them. 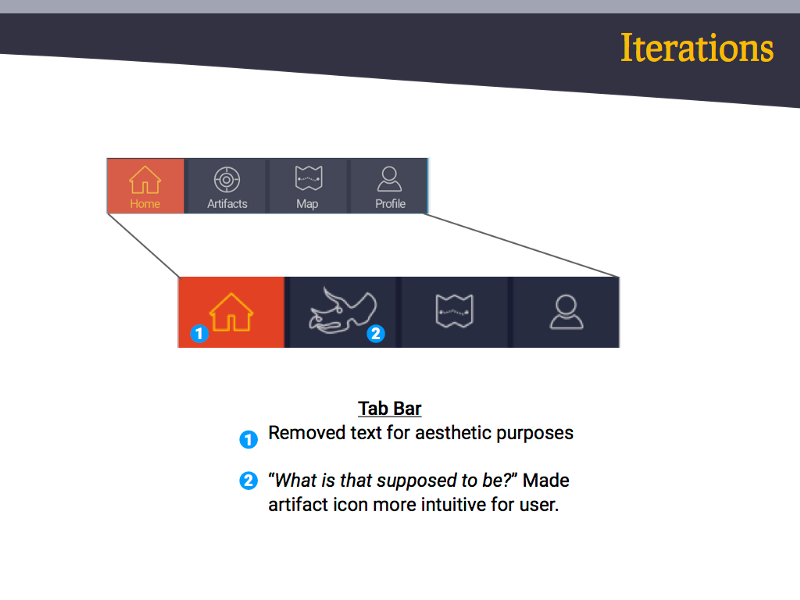 I worked with two other UX designers, Arjun Pundakari and Jessica Celano. 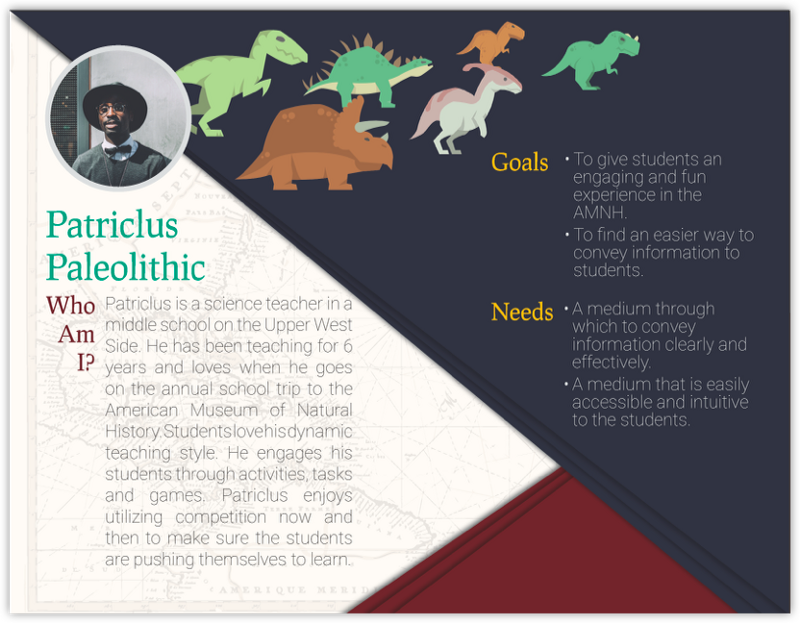 We discovered we had a shared passion for science and nature and we decided that we would pursue a project for the American Museum of Natural History. Founded in 1869, the American Museum of Natural History is a thriving institution located in the Upper West Side of New York City. They have 45 permanent exhibition halls, a library, and the Hayden Planetarium. They average around 5 million visitors every year and they offer education events such as symposia, lectures, workshops, and performances. 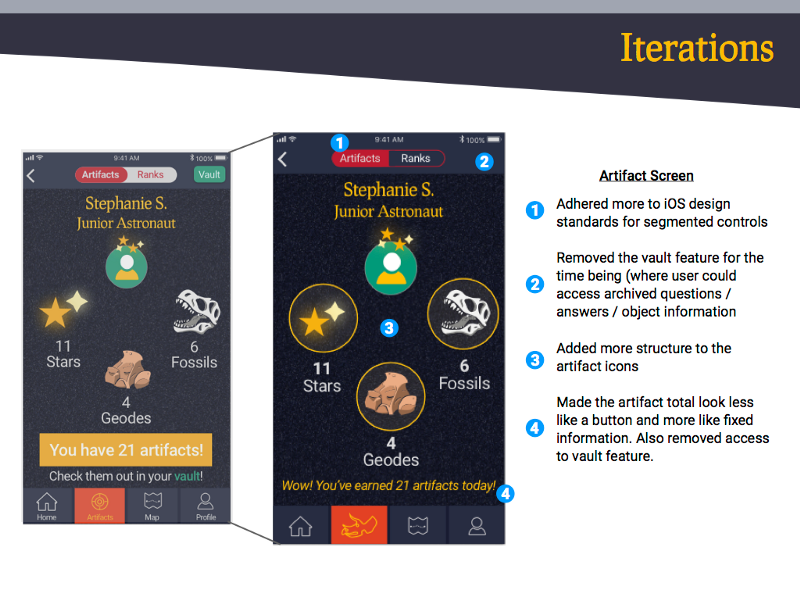 After doing some preliminary research and discussing the topic as a team, we decided to make an app for upper-elementary and middle school children (Ages 8–12). 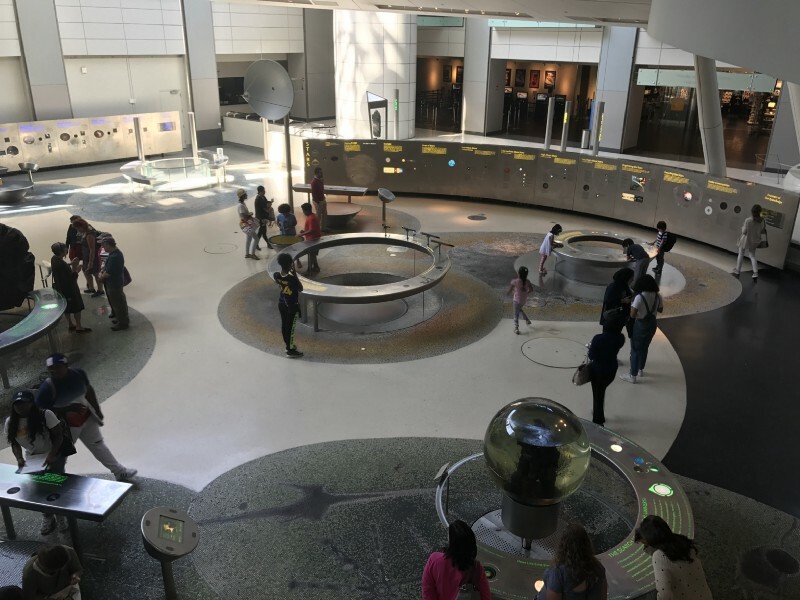 The AMNH has a wide variety of content housed within its exhibit halls and while there are interactive displays, a large portion of subject matter is presented in a static format. 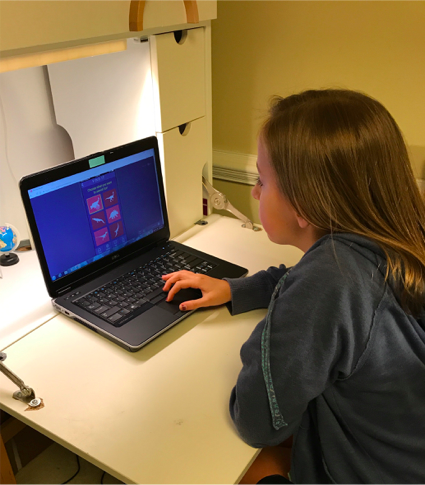 Since we want (and need) children to be interested and invested in science, we are hoping to utilize children’s technological prowess to make exhibits more interactive and take them to the next level. Museums have long been stationary and grounded creatures fading with time. Therefore, there is an opportunity to bring them into the modern age. How might we use technology to encourage children (and adults) to have fun and be engaged while learning about science? We conducted a competitive analysis of the American Museum of Natural History in NYC, the Liberty Science Center in NYC, the Exploratorium in San Fransisco, and the Natural History Museum in the UK. We were examining features and services offered by the museums and found that, across the board, most museums are offering similar experiences and opportunities. After our analyses, we released a survey with the intent of getting people with relevant experiences to interview with us. Our ideal interview types were parents and teachers who have an interest in science. We received 26 responses to our survey and we selected 7 participants to interview. After completing our research and synthesizing the information, we created three personas for our experience. Our primary persona is an 8-year-old named Stephanie. She is a great student, but her favorite subject is English and struggles from time to time in science. This is mainly because she doesn’t find it as interesting as English. Our secondary persona is a 10-year-old named Thai Li. Thai Li wants to be a paleontologist one day, so she is always very excited for science field trips! She wants all the information she can get on dinosaurs, it doesn’t matter how the information is presented! Our tertiary persona is a science teacher, Patriclus. He loves teaching and his middle school classes love him! He is always writing fun raps about osmosis and looking for ways to engage his kids with the material they’re covering. How might we provide a more immersive and interactive experience for children and adults at the American Museum of Natural History? From the insights gained during our research and synthesis, we selected three features to focus on during the development of our product. For augmented reality, we would like for some halls to have “real” dinosaurs, planets, or mammals accessible within them. For example, if a child is in one of the dinosaur halls, after walking up to a specific display, the child could activate the AR feature and a skin would be placed over the dinosaur’s skeleton. Ideally, the dinosaur would be able to be manipulated (rotate, zoom/shrink, etc) thus, bringing it to life!! There would be an option to learn more about the selected dinosaur that, when selected, would activate fact bubbles to pop up around the AR dinosaur. 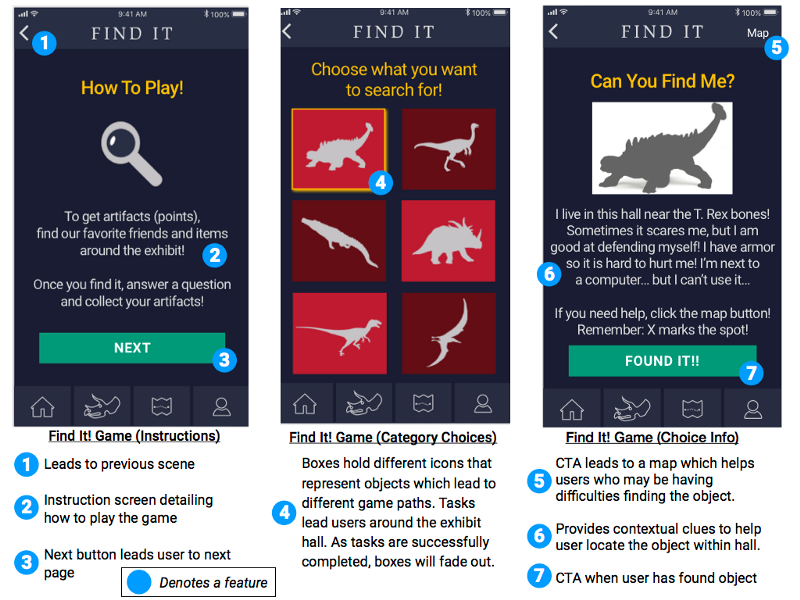 Another feature that we would like to pursue is the “Find It!” game. For the MVP, we would focus on three exhibits for these features: Dinosaurs, Space, and Geology. 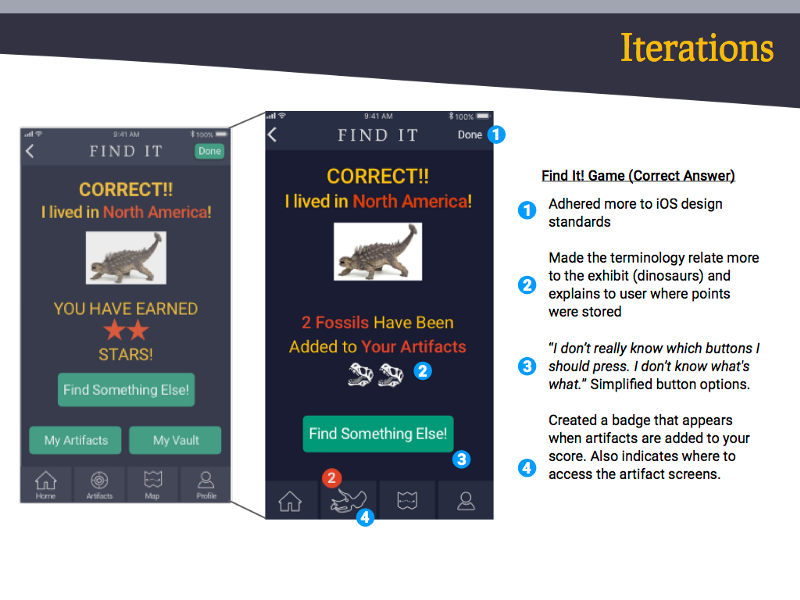 With Find It!, students will be able to earn points by going on a scavenger hunt around the museum. The more things they find and the more questions they answer correctly about their topics, the more points they will earn! Some answers the children need can only be found on the plaques by the correct display, which ensures that the children are engaging with the museum space, not just their phone. We decided to design an iOS native app. We believed it would be the most accessible platform for children because most children either own their own smartphone or have access to their parents’. This could be developed in anywhere from 2 weeks to 2 months depending on the developers. 2 months would allow for a generous buffer which could be used to fix any errors or problems that are encountered. 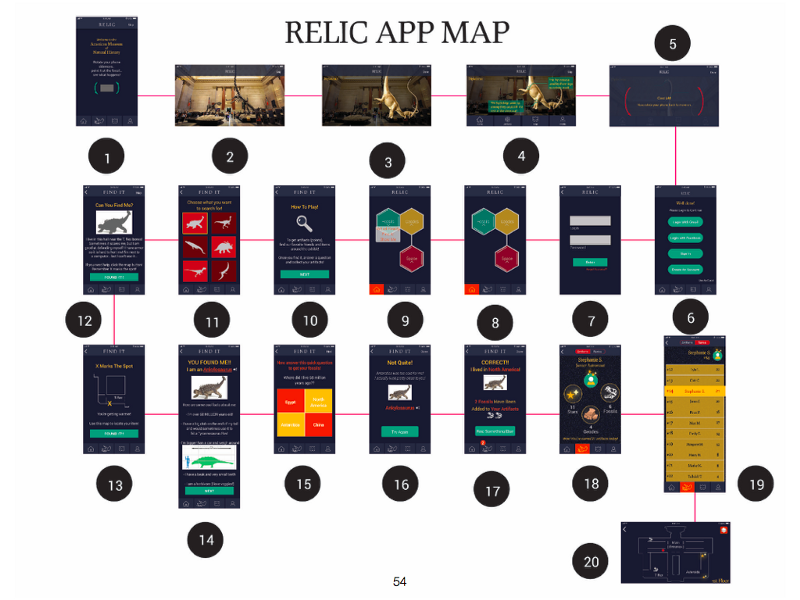 After our research and synthesis, we held a design studio to begin sketching our visions for the interactive AMNH app, Relic. 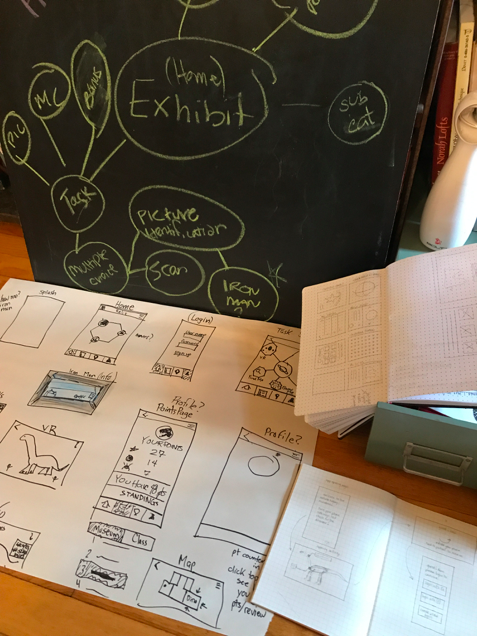 After we completed our sketches and design studio, we used Sketch and Invision to create wireframes and mockups that were used for Usability Testing and the final prototype. The following are examples of the screens used for the Find It! game. We have several next steps that we would like to take. The first and foremost being developing the app for the iPad. Some classrooms have access to iPads as a supplemental learning tool. This may provide access to the experience that some kids may not have! 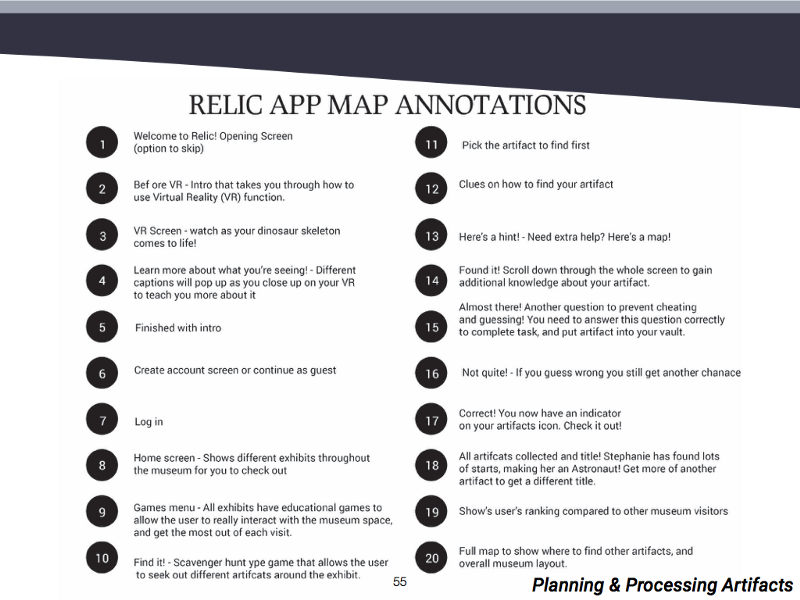 Going off of this point, we also would like to work with the museum to create a rental kiosk for devices. Again, this would ensure that everyone has access to this learning experience. 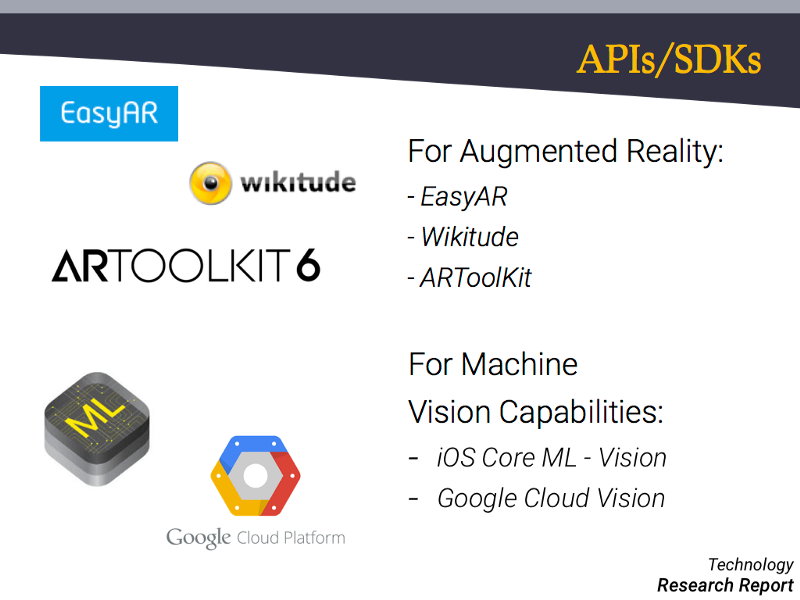 We would also want to expand the AR library to include more than just several dinosaurs, planets, and geological elements. There are also mammals and archaeological excavations and bugs and historical figures. The possibilities are endless! We have a third feature (Show Me!) which would create an almost Iron Man-like view on the screen of the device that is being used. When moved around an exhibit, different displays will be highlighted and facts will be shown to the user. We believe it’s a fun and exciting way to be shown information that children would enjoy. 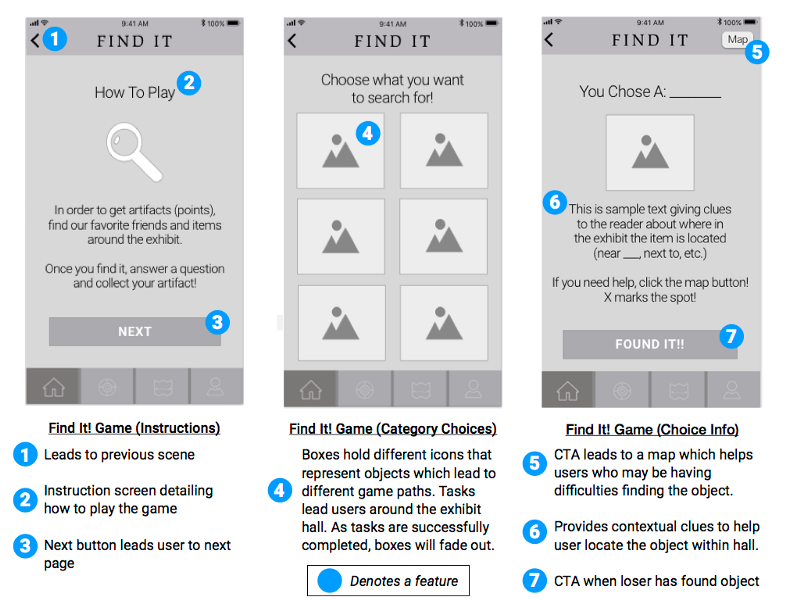 Lastly, we would like the feature “Find It!” to be less competitive and more gamified to avoid having explicit winners and losers. We loved working on this app and would like to revisit the idea in the future!